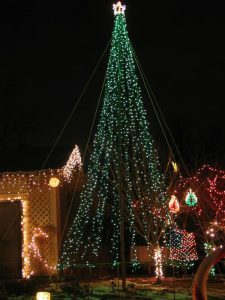 Our original “Mega-Tree” served us well for nine seasons, 2003-2011, and was our first major display item that used music-synchronized computer animation. Like our current Mega, the Mega-Tree was a 20-foot, freestanding 3-dimensional Christmas tree, which thanks thanks to computer control, can animate, change colors, spin, flash, and do many other effects all synchronized to our FM radio broadcast of Christmas music. Although it didn’t have the capabilities of our current pixel-based tree, it was still pretty fun to watch, and was quite novel when it debuted in 2003. The tree could take on many different colored effects. It could change between three different solid colors, and perform many animated multicolor effects and color morphs. 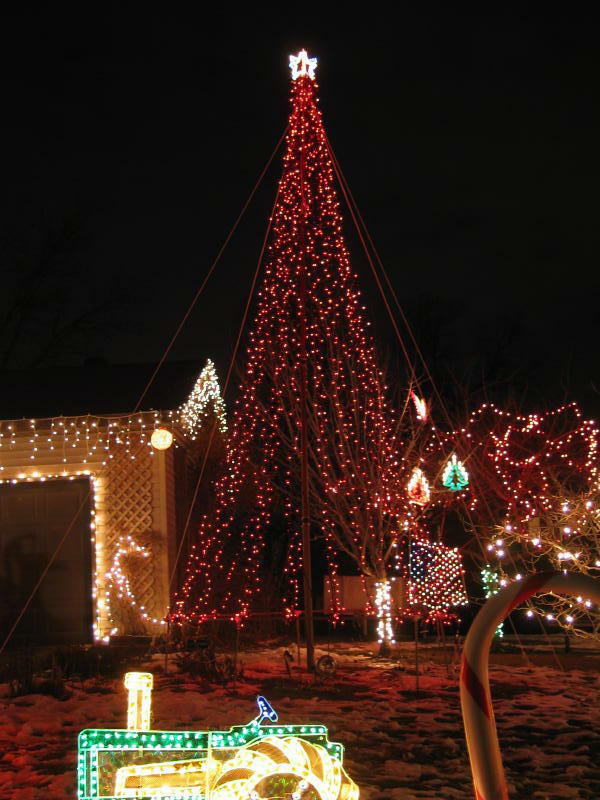 In the photos below, taken the first year we had the tree, show the tree in an all-green, all-red, and a gold and red configuration. 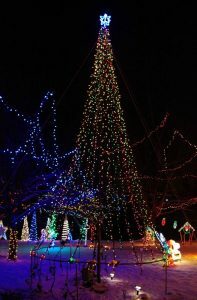 The tree was made up of 5500 lights. In 2006, we added 12 miniature “curtain strobes” which go down the center of the main pole and are used to provide a sparkling effect at certain times in the music. It stood approximately 20 feet high and 10 feet in diameter. 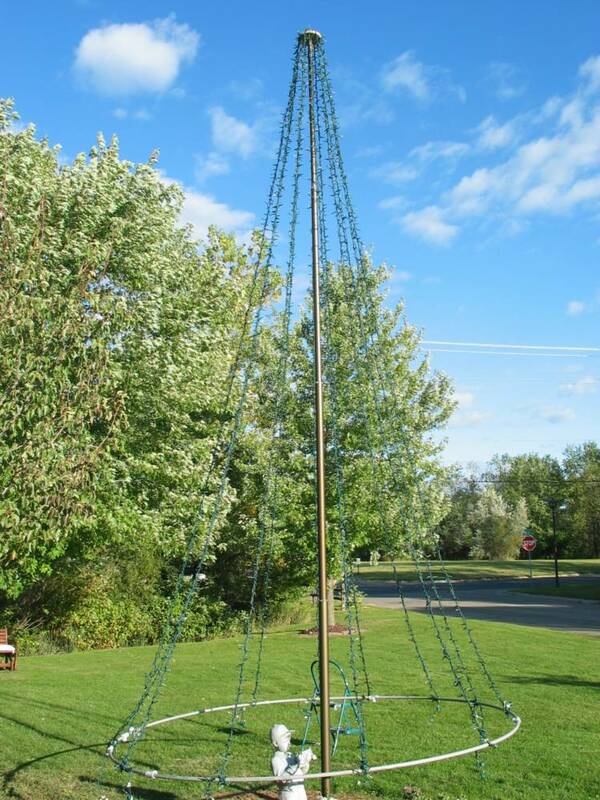 The primary structural element for tree was a telescoping flagpole which we purchased and installed in May 2003. 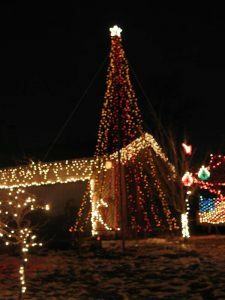 The telescoping nature of the flagpole allowed the tree topper and lights to be installed near the ground, then the pole raised to its full 20 foot height. There were 36 computer-controlled channels (the original 2016 verison had 30) dedicated to the tree itself, and 3 additional DMX channels to control the star, which could be virtually any color at any given time (earlier versions had a single star channel).. 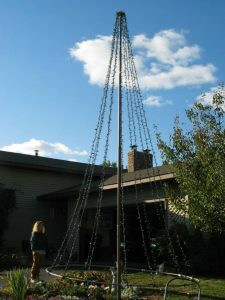 The tree consisted of 12 vertical “slices” (the original 2003 version contained 10), each slice being a string of lights which went up from the base to the top of the tree and back down the opposite side. Each slice consisted of 3 colors — green, red, and gold. There were 3 computer-controlled “channels” per slice as well, so each color of each slice could be controlled independently by the computer– allowing the tree to change color at will or be displayed in many combinations of color. 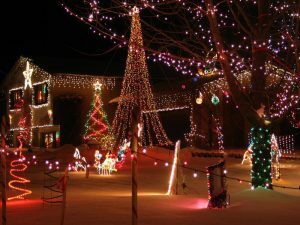 Each slice consisted of three 150 mini-light sets, each created by hardwiring one 100-lite set of each color to 50 additional lights from an additional 100-lite set. The three 150 light strings were twisted together for a “mega string” of 450 lights. The base of the was constructed of 30′ of gray PVC conduit, which bends into a circle easily, and is supported by additional lengths of conduit supported by rebar into the ground. 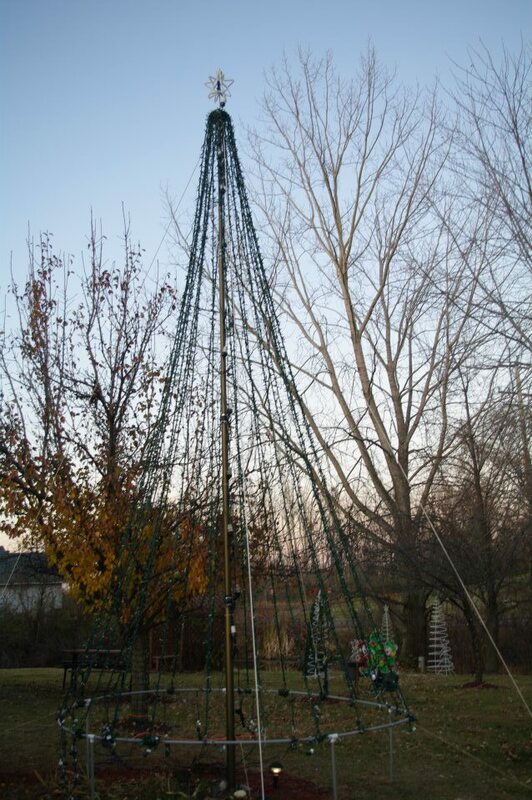 With all of the lights and the tree topper, there is a lot of weight on the flagpole, so we added some rubber drainage pipe clamps to help take the weight off of the pins that hold the pole up. The tree is also guy-roped from four directions to stabilize it. 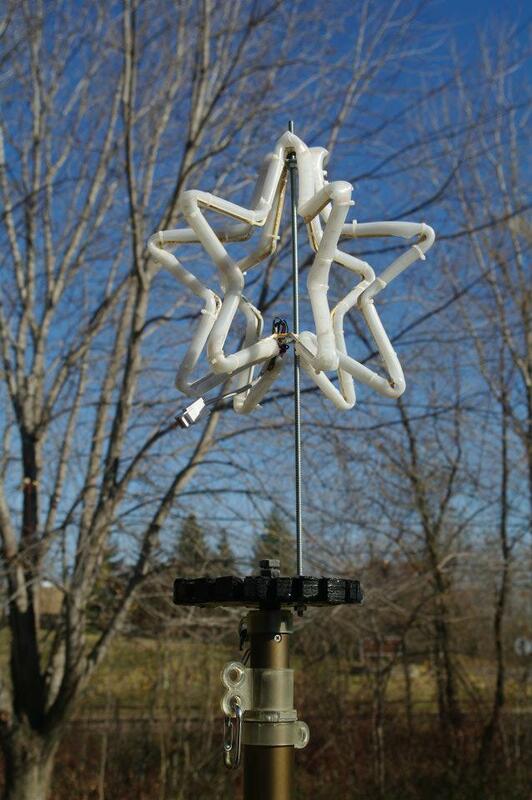 In 2011 we removed the removed the original rope-light from the star topper and replaced it with RGB flexible ribbon. The ribbon was first placed in a split opaque-plastic water tube to give it better color distribution. The new lights are controlled by a small DMX controller and 3 computer channels, each controlling the Red, Green, and Blue elements. Those three primary colors can be mixed to create just about any color for the star. Unfortunately it’s impossible to show the animated effects via static pictures. 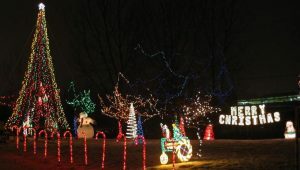 To view the original Mega Tree in action, please see the video links on our 2011 display page. The two pictures above show a couple frames of the animation (from our 2003 display): to the left, a red tree with a spinning green “tree slice”, and to the right, multicolored slices spinning. The Mega-Tree was in planning and development for about a full year. There were numerous technical and logistical issues to solve. Fortunately we didn’t do this in isolation– there were a few other folks out in the Christmas chat room making similar trees, so we got to help each other through the issues. The nice thing about home-constructed displays is that even though several of us were making similar ones, they all differed significantly in terms of implementation, number of lights, and animation capabilities, so each of these is truly unique! The Tree was expanded for 2004. 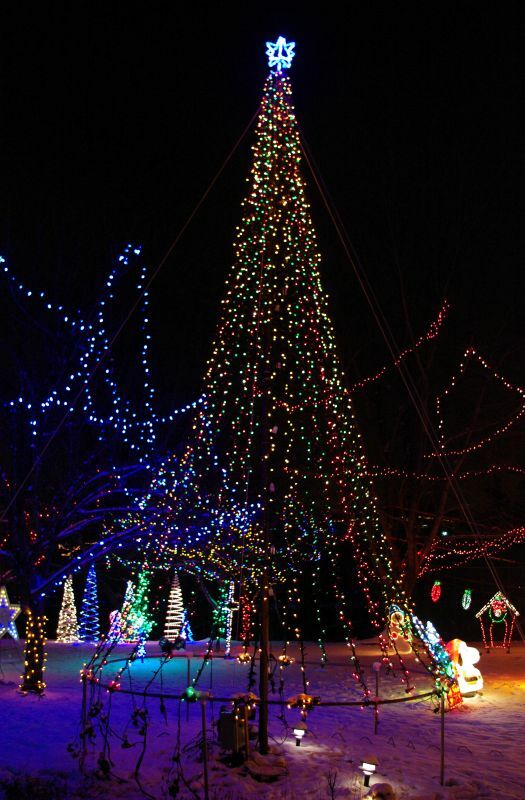 The original tree contained 4600 lights and 10 slices. We decided to expand it to 12 slices because 12 is a nice number for sequencing music to (music is typically written in meters of 4 or 3, which divide nicely into 12). 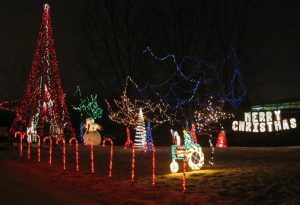 The tree is also somewhat fuller with the addition of these slices and additional lights. On September 28, 2003, we ran our first “live” proof-of-concept test with the mega tree. With about 60% of the light strings completed, we hung them on the flagpole to see how it would handle the weight. Everything went well, although the test brought up some minor issues in time for us to correct them. Below are some pictures taken during this test– note that the PVC base is just hanging (crooked) by the lights, and is not complete in these pictures since it wasn’t finished for this test. 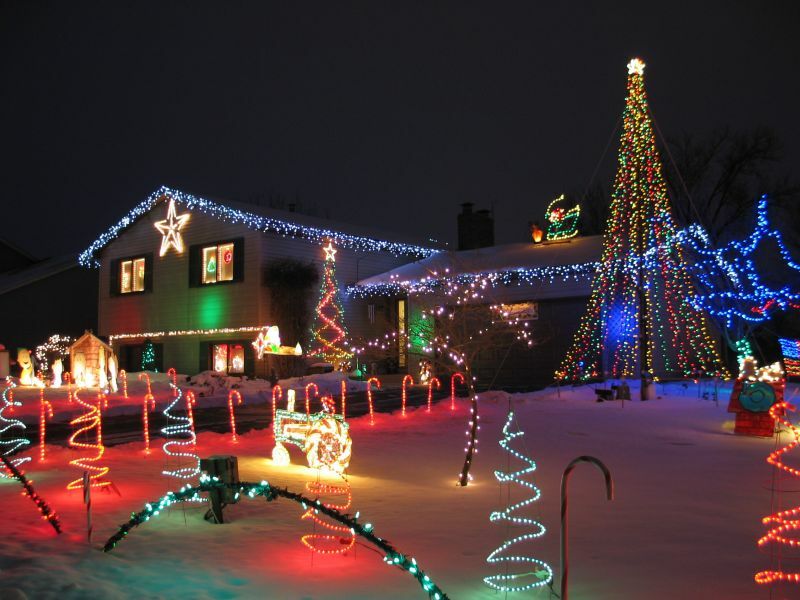 As an aside, boy did we get some strange looks from neighbors driving by as we tested Christmas lights in September! Our 2003 Christmas Log describes how this display (as well as the rest of our displays) progressed throughout the 2003 year, when it was in development. As note above, for the 2011 season we replaced the lighting on the original star topper with RGB flexible ribbon, giving it better brightness and the ability to change into virtually any color. We also changed the mounting method so the star ‘floats’ slightly above the tree, rather than sitting directly on top of the tree’s light strings. 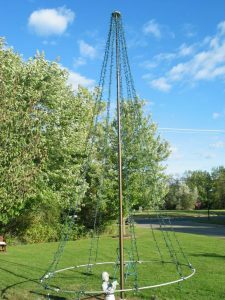 Here are a couple of pictures of the star topper taken during setup for the 2011 season. This version of the mega-tree was retired after the 2011 season, but its replacement shares much of the same structural design. 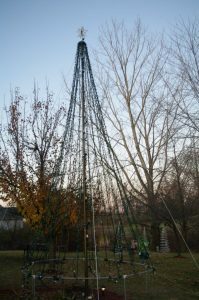 Need more info on the tree’s construction and how we set it up? Here is a 10 minute video which shows us setting it up for the 2005 season and describing what’s involved Sorry about the terrible audio quality — evidently our video camera picks up everything but me! Even though we’ve updated the mega-tree, we still use this same basic technique today.